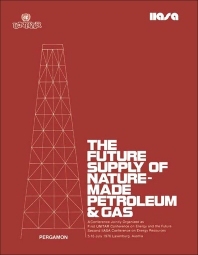 The Future Supply of Nature-made Petroleum and Gas Technical Reports is a collection of papers that covers various issues and concerns in the world petroleum supply. The materials in the book are organized thematically into sections. The text first covers the world perspectives of conventional petroleum, and then proceeds to discussing the classification of petroleum resources. Section III deals with the conventional oil and gas deposits, while Section IV talks about enhanced oil recovery. Next, the selection deals with gases in tight formations, along with tar sand, heavy oil, and oil shale deposits. The eighth section tackles gases in geopressured reservoirs, while the ninth section details other unconventional petroleum and gas deposits. The last section deals with concerns in technology transfer of petroleum and gas technology. The book will be of great use to researchers and practitioners in disciplines involved in the petroleum industry. Chapter 23: ENHANCED OIL RECOVERY: WHAT OF THE FUTURE? Chapter 26: TERTIARY OIL RECOVERY: HOW COME IT’S CALLED THAT? Chapter 53: METHANE HYDRATE IN THE SEA FLOOR--A SIGNIFICANT RESOURCE?